Happy Friday everyone! It is time for another one of Beate’s wsc. I’m all for having a little surprise on the inside of the card to continue the theme from the front….so I thought I would try it out on this card. It is hard to see straight on, but I have a transparency sheet (acetate) within the main image with some of the details upfront and others in the distance. This process of layers was very time consuming, but with the end result, I think it was well worth it. I first stamped the image in Old Olive ink on Whisper White and had to cut out most of the image to create the frame. The next layer is Acetate. 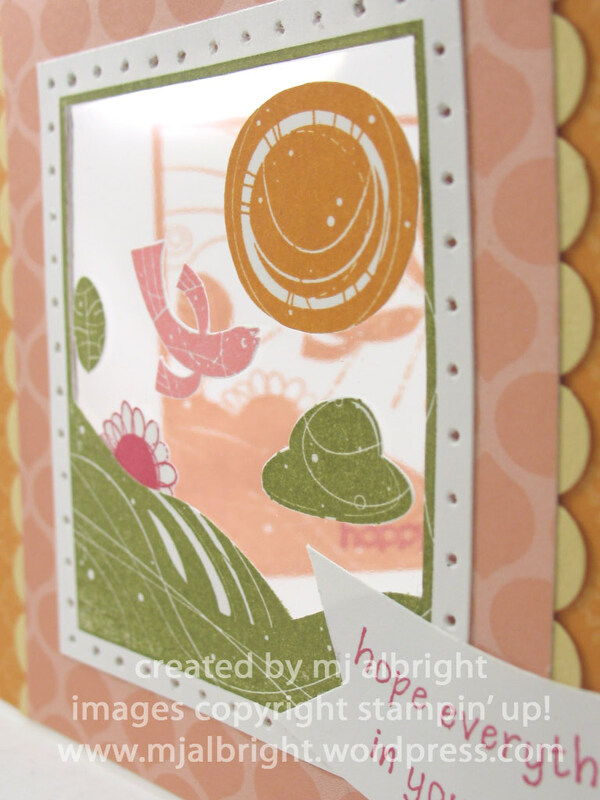 I had to match up the cut out rectangle on all the layers of DSP and the Whisper White card base. I repeated stamping the image but with the colors I needed. I then cut out all the images and adhered to the Acetate with Mini Glue Dots. The background of the image (sun rays and whimsical swirls by the bird) are not on the Acetate. They would be part of the surprise on the inside of the card. The inside is very different from the outside of the card. Very simple image revealed with a happy little sentiment. 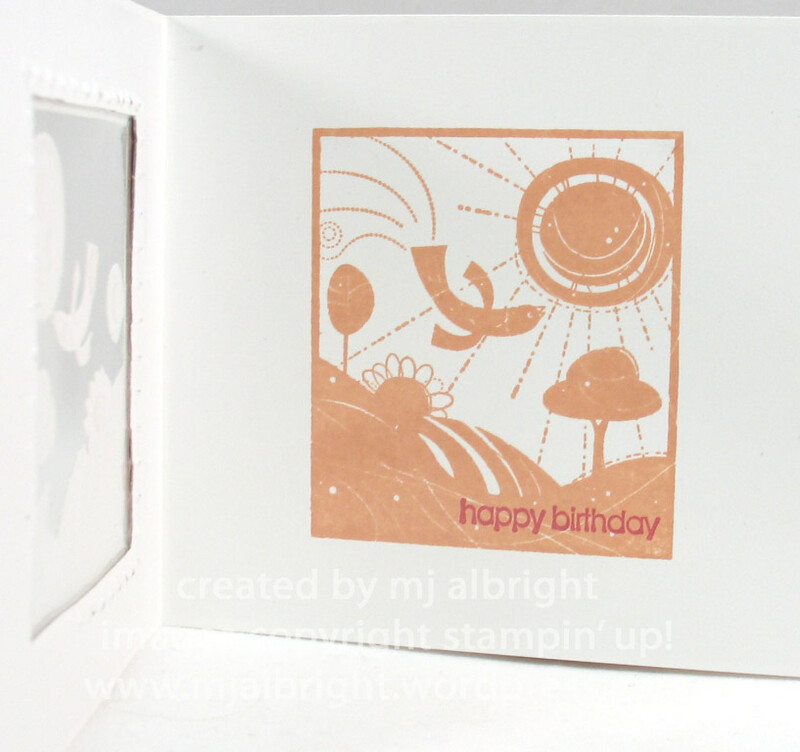 I stamped the image in Groovy Guava ink and the sentiment is Rose Red ink. You can see some of the details of the window to the left….there was really no neat way to hide all the craftsmanship , but I think it doesn’t look bad due to it all being white. ACCESSORIES USED: Earth Elements colored Brads, Linen Thread, Mat Pack, Acetate, FLower Fusion, Scallop Punch, Sticky Strip and Mini Glue Dots. oh my word. this is just amazing, truly amazing. send it to me – i’ll be the judge of it “doesn’t look bad” LOL! Beautiful, amazing work. Wow. Oh my goodness! This is fabulous! I LOVE it! How neat! Girl, you are blowing my mind every week! Every time you use this set I feel like I NEED to order it. You are so creative! Dang….this is beautiful! wow, that is a wonderful idea! Very nice card. Holy-smokes, this is one awesome card, MaryJo! LOVE the acetate window and all the 3D details were certainly worth the effort! MaryJo, this is wonderfully clever! Really adorable! WOW!!! Mary Jo, this is outstanding!!! 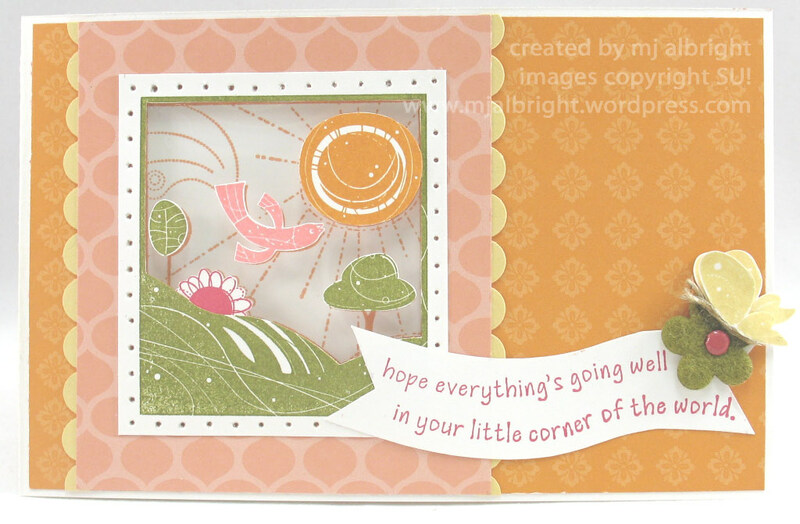 You really made this stamp come to life…and as usual your color combination is so unique and beautiful!! Wow, this is totally amazing! Great job!! What an amazing card! What a cool 3D effect you created. Thanks so much for sharing such a wonderful card. Wow, what a cool card! It looks like it took a lot of time and effort. Could you let us know of a link on how to create a similar card? WOW! Mary Jo this is beautiful! It looks like alot of work but well worth it! Oh wow wow wow….you are so clever! This is fabbo! I am jaw*dropped speechless! This is incredible, MJ!! FABULOUS!! Hope your weekend of work goes well….I’m hoping to hear good AA news from you this week! No matter the outcome, you are my award choice! Hugs!! Wow, Mary Jo, this is such a cool technique! Love that card! very creative, love the idea and it turned out lovely! Fantastic! Blows me away….wonderful use of this set. I think this set is ugly and most cards I see aren’t that great, but you make each card like a masterpiece. I am half tempted to get this set because of you!! Just gorgeous, MJ! This is so darn clever! LOVE it! Wow, another fabulous creation of yours! Love it!!! Oh my God! This is just beautiful. I saw something like this at a Hallmark store and thought hum, can that be done by hand?? and you did it. It is simply great. Time consuming I can see but just lovely. Great job!